Alchemist of Light follows the true story of cinematic special effects pioneer Georges Méliès, and his wife, Jehanne, and their struggles in 1914 France at the onset of World War I. When Méliès faces eviction from his cinema due to low attendance, he makes plans to produce his fantastical moving pictures in America. While departing the theater one day to meet an American movie mogul, Méliès receives two unwelcome guests: Leon, a cynical pickpocket with a tortured soul, and his reluctant accomplice, Otto, a German exchange student forced to hide his identity amidst the anti-German tumult. Fortunately, four additional people, each from a very different walk of life, wander simultaneously into the theater. What follows is an onstage depiction of the conflict between reality and fantasy. As Méliès attempts to convince his audience of his onscreen magic, he contemplates whether providing an escape from the harsh realities of life benefits society or simply gives people false hope. Ultimately, the play poses a question for its viewers: in times of universal suffering, is it best to remain grounded in reality, or can fantasy serve as a crucial means to transcend suffering? 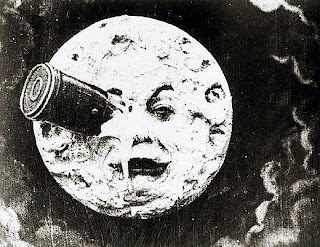 The use of Méliès’s actual cinematographic works and the vaudevillian background music in this production transport the viewer to the very beginnings of the film industry. The character development is exceptional. Tom Lock in particular gives a spellbinding performance as Leon the pickpocket. His carnal emotionality leaves one on their edge of their seat waiting for his next movement. Alchemist of Light will appeal to theatergoers of all ages, as it has a little something for everyone: comedy, passion, drama, enchanting technological and musical features, and even a mermaid! I highly recommend it!